Apple's long-awaited iPad refresh is finally a reality. Apple's new full-size iPad, rebranded as the "iPad Air", starts at the usual $499 price. Apple also unveiled an iPad mini with retina display, with a higher starting price of $399 and retained the original iPad mini at $299. Finally, the aging iPad 2 was also retained with the price unchanged at $399. This essentially proves my theory that Apple's pricing strategy has nothing to do with a "price umbrella" and everything to do with margins. Apple's primary business model is selling high-margin hardware, so this should come as no surprise. While many like to draw comparisons to the iPod, the limited set of "jobs to be done" allowed Apple to aggressively slash BOM costs, thereby allowing lower prices at higher margins. This approach is no longer viable for the iPhone/iPad because of broader use cases and competition from modular vendors. Based on this, let's take a look at the iPad product portfolio and gauge its impact on Apple's holiday quarter. When the iPhone 5s was launched, I was critical about the need for a 64-bit processor as the product had no more room to move upmarket. However, a 64-bit processor for the iPad opens up the possibility of creating desktop class applications for enterprise users. This could help the iPad move upmarket and displace PCs for lightweight productivity. I still feel like Apple missed an opportunity here as a keyboard cover could have driven home the point. While the 64-bit architecture should open up the possibility for an upmarket move to enterprises, it is unlikely to have an immediate impact in the holiday quarter as application support needs to be expanded beyond iWork/iLife. Apple also retained the 30-month old iPad 2 at the 18-month old $399 price. While a full-size iPad at that price price point may appeal to some niches like the education sector, the product/price trade-off looks like a clear attempt to shore up margins. If margins weren't a concern, Apple could have retained the 4th generation iPad at $399. This is the strategy that effectively disproves the "price umbrella" theory. If Apple's motive was to eliminate the price umbrella for competitors, it could have lowered the price of the original iPad mini to $249 or lower. Instead, Apple chose to reduce price by $30 which could be lower than the BOM reduction from last year's launch. It is clear that Apple was spooked by the cannibalization and margin erosion caused by last year's iPad mini launch and sought to correct that "mistake". 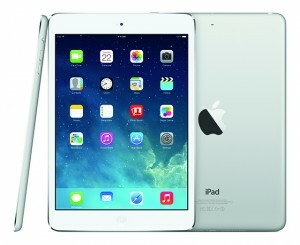 Apple also launched the highly anticipated retina iPad mini for $399. The retina display would have added to the BOM costs, so Apple chose to increase price to safeguard its margins. After the iPad mini launch last year, consumer interest rapidly shifted from the 9.7" model to the 7.9" model. Since use cases were similar, a lower priced product seemed like the natural choice for iPad buyers. While Apple hoped to attract new buyers at the lower price, cannibalization and the lack of a mid-year iPad refresh led to a YoY decline in fiscal Q3 (and possibly another YoY decline in fiscal Q4). Investors have pinned their hopes on this iPad refresh to revitalize demand and reignite growth. However, this refresh may not have a major impact on holiday quarter sales. The most awaited product from this refresh, the retina iPad mini, is rumored to be in short supply until early next year and seems overpriced compared to market expectations. This leaves the $499 iPad Air, the $399 iPad 2 and $299 iPad mini. Based on this and the intensity of competition from cheaper, "good enough" Android products, I wouldn't be surprised if holiday quarter iPad sales remained roughly flat. 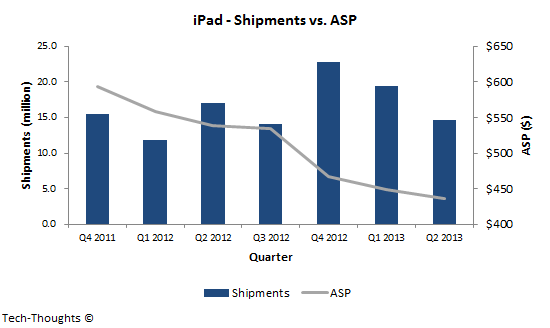 Given the growth seen by the rest of the tablet industry, this should be concerning.